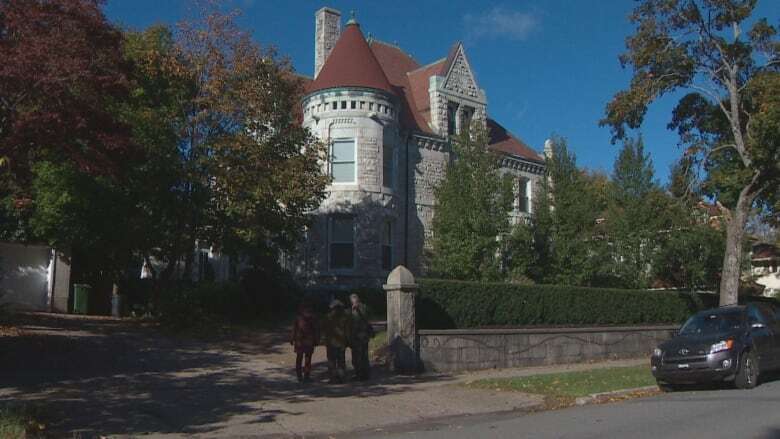 A small fire broke out on the roof of the well-known mansion in south-end Halifax as a result of some roofing work being done Monday morning. A small fire broke out on the roof of a mansion in south-end Halifax as a result of some roofing work being done Monday morning. Dave Slaunwhite, a district chief with Halifax Regional Fire and Emergency, said fire crews were called at around 9:30 a.m.
Five trucks and about 20 firefighters responded to the call at the building on Young Avenue, which is often called the Oland House. Slaunwhite said he isn't sure what repairs were being done that sparked the fire. The fire is under control and firefighters are checking for hot spots. Slaunwhite said the damage isn't significant. "We ended up having to cut a bit of the roof to check for extension and that's pretty much it for damage," he said. Slaunwhite said one of the roofers is being treated for minor smoke inhalation.